Lehenga is a favorite with Indian women. Saree is no different. Imagine turning your saree look into a lehenga style for a change! Does that turn heads? Yes, you will certainly love yourself more in this lehenga saree that transforms your looks and adds a stylish touch. Flatter yourself in an easy-to-drape saree style that requires no practice and is easier to manage to add sparkle to your looks. Because of the ease and convenience of tying, lehenga saree has become the hottest trend in this fast-paced world. Thankfully, lehenga style saree is not only a time savior, but also an easier variant of the traditional style. The fusion of two traditional dress forms does promise to enhance your looks. Who doesn’t want to look more beautiful? Saree wearing may look challenging, but the magical appeal of sari never fades. An ideal outfit for formal, informal occasions and celebrations, sari dons the women apparel industry in India. Unlike a traditional saree, a lehenga saree is a 4.5 to 5.5-meter-long semi-stitched fabric, which may be georgette, chiffon, crepe, lurex, jacquard looms, or silk. The lehenga saree pack comprises blouse, skirt, and pallu. But you can wear your normal sari in lehenga style. How? Let us see. When draping a lehenga style saree, you do not have to worry about the alignment of front pleats, as ornamentally embellished panels replace pleats, giving a classy touch to the drape. Like traditional saree, a lehenga saree doesn’t require special skills to drape – just tuck and drape pre-stitched pleats and you are done! It’s as simple as that! No hassle of making pleats, no time-taking draping, no risk of slipping or falling. A lehenga saree is a boon for young girls who have never worn a saree, but can easily manage to drape a lehenga sari and spice up their looks. To avoid fluffiness around the waist, wear an underskirt that can keep your lehenga sari in proper shape. Let’s begin draping a simple saree in lehenga style. Choose a saree of your choice and get a matching blouse and petticoat to create a complete look. Keep some safety pins handy. Start with wearing the blouse and underskirt or petticoat around your waist. You may want to wear a belt fastener petticoat to do away with the hassle of tying usual strings that may make you feeling bloated, ruining your appearance. Make sure it is tied tightly enough to hold the sari weight. Of course, you want to walk and carry yourself comfortably. But a pair of heels does enhance your looks in a sari. Start by wrapping the plain end of the sari around your petticoat or underskirt until you reach the right side of the waist. Make a full turn, just like you do when you wear a regular saree, returning to the starting point and tucking it in the petticoat. The border should be on the bottom. Start making small pleats along your waist. The smaller the pleats, the more refined your lehenga sari will look. With several pleats tucked in around the waist, the sari creates a lehenga-like effect, making the overall look dashing and trendy. Start from the right side, going back making small pleats and tucking the pleats inside the underskirt. Make sure the pleats are tucked in well to create a flawless look. This is exactly the stage when folds are formed in a regular saree. In a lehenga saree, you need to continue wrapping the pleats around the waist and tucking them inside the underskirt. Bring the rest of the sari to the opposite end after you have tucked in the plain end. Now you do not need to make pleats – just tuck in the rest of the middle part, while leaving enough fabric to drape the saree around the waist one final time along with the pallu. The pallu should not be too long. You may want to make pleats with the pallu. Make 5-6 pleats with pallu to flaunt heavy stone work of your blouse. Keep making pleats with the remaining pallu and wrap it one final time around your waist in the right side and place it over your left shoulder. There are different styles of wrapping the pallu. You may want to drape the pleated pallu like a dupatta in the front, where it forms a V-shape in the center. Front pallu is a good option if the saree has a heavy border on pallu, creating a wearable and stylish look. 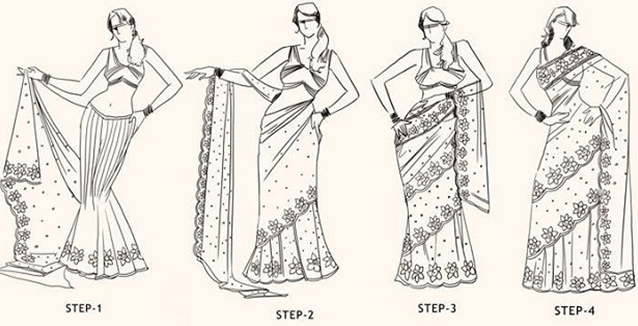 Pin the pallu neatly like you do for a traditional saree. This will ensure the pleats remain intact. Adjust as many pleats as you may want to achieve the desired body frame. It’s up to you whether you choose to make pleats or leave it flowing to create a traditional yet trendy look -just like a lehenga. When pinning the saree, make sure you do it carefully and do not damage the fabric. Make sure your sari covers your feet and petticoat, creating a symmetrical lehenga look that outshines your looks. Sari is the undisputed leader when it comes to versatility of draping styles. Legenga sari look is apt for wedding and traditional functions. More often, this type of sari flaunts a pallu in contrast color, making the sari look attractive and eye-catching. A draping twist to your saree will give you a glamorous lehenga style sari that will make you look gorgeous.